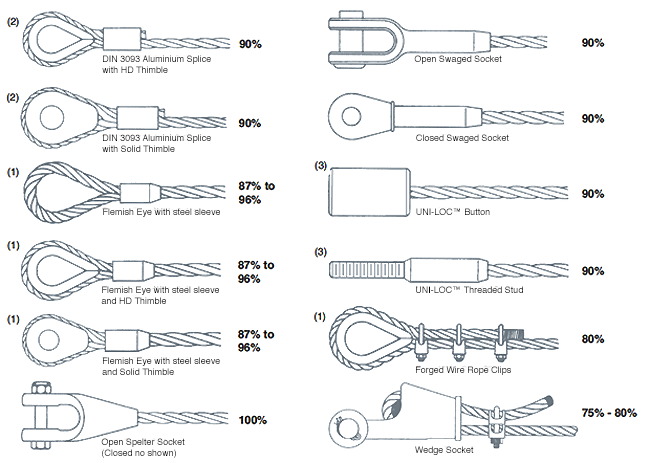 This page lists several types of end terminations used for overhead lifting applications. All efficiency ratings are based on the difference between the actual breaking strength of a rope and the attained breaking strength with that specific fittings. The only fitting which will attain a 100% efficiency are spelter sockets; provided they are properly attached. ALL other fittings are swaged or clamped onto the rope. The swaging or clamping process compresses the rope to varying degrees causing a slight loss of strength. Some publications refer to ‘100%’ efficiency with swaged sockets. Bear in mind, that most wire ropes have an actual breaking strength up to approximately 5%-15% HIGHER than the breaking strength listed in catalogue tables. In other words: a fitting having an efficiency rating of 90% may very well develop 100% of the rope’s CATALOGUE breaking strength because the rope’s ACTUAL breaking may very well be 5%–15% higher. (1) Use only with 6-strand wire rope. Efficiency rating depends on rope size and core type. (3) Fabrication efficiency depends on fitting dimensions. Ask for information on UNI-LOC™ Assemblies.